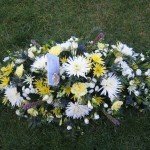 Coffin Sprays are suitable for on top of the coffin. 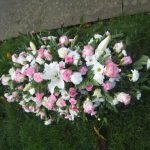 They are usually made to fit in the middle of the coffin but can be made in various sizes to your requirements from 3ft upwards. 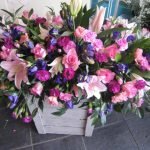 As these designs are made to order please allow as much notice as possible (48 hours or more is advisable to ensure flower availability. 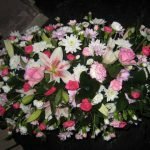 Family Funeral Flowers can be expensive. 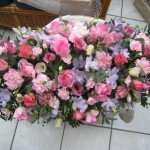 That’s because there is a lot of hours that go into one piece. 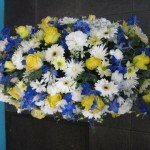 However, by dealing directly with us at Jacaranda you can be guaranteed to save money. 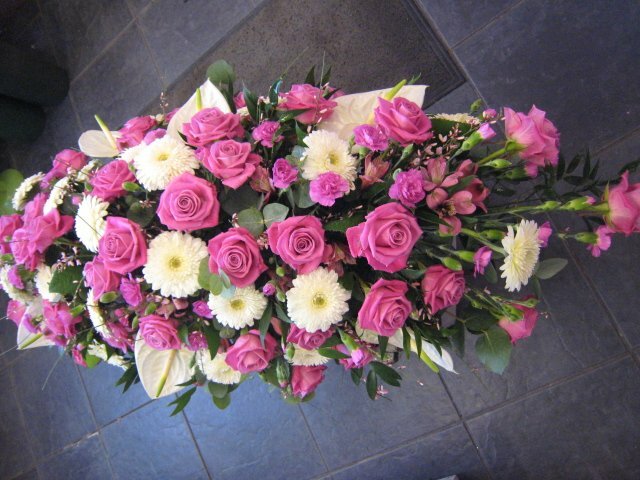 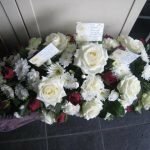 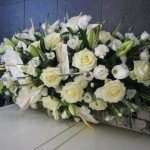 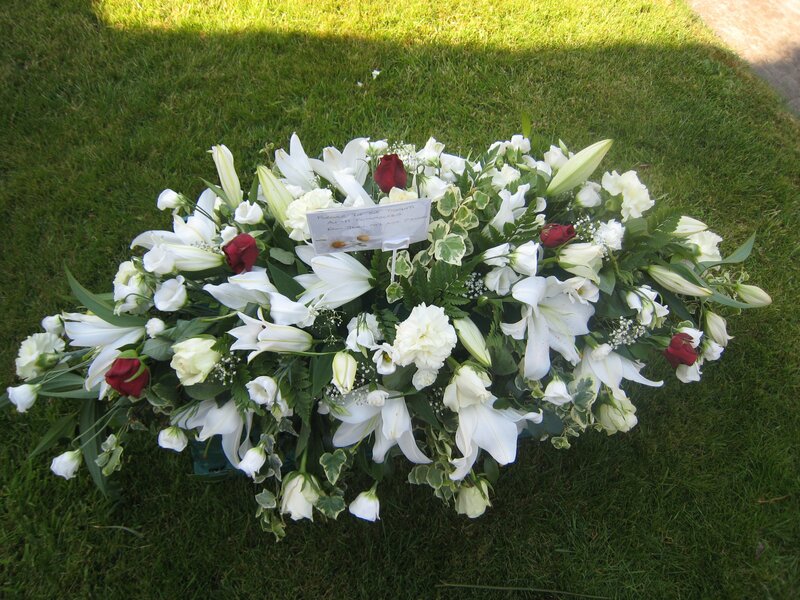 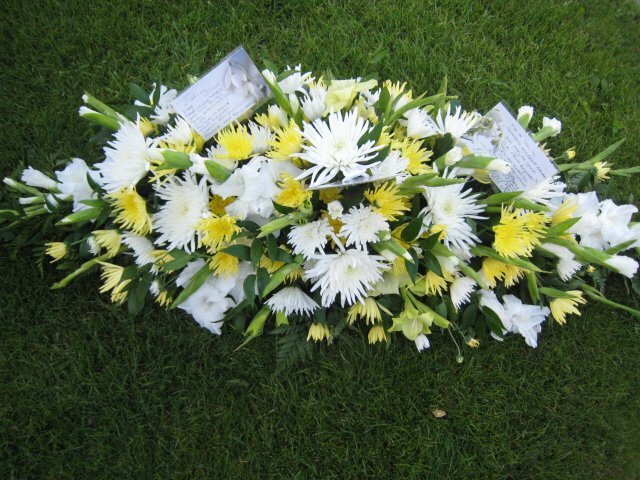 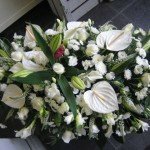 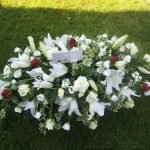 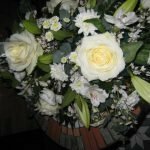 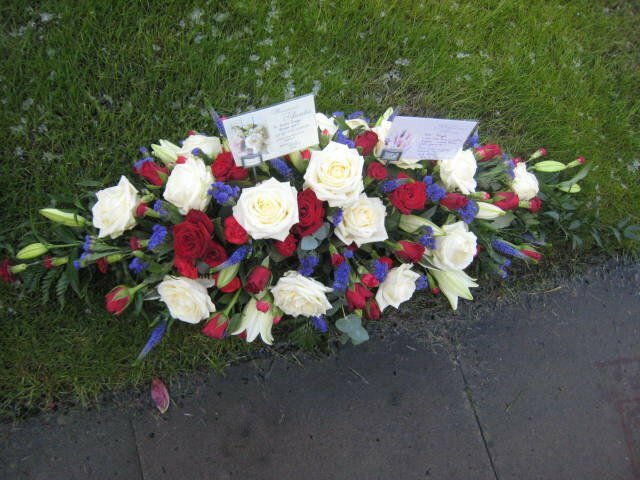 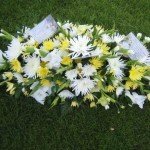 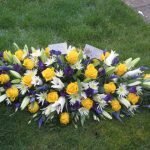 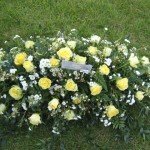 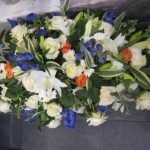 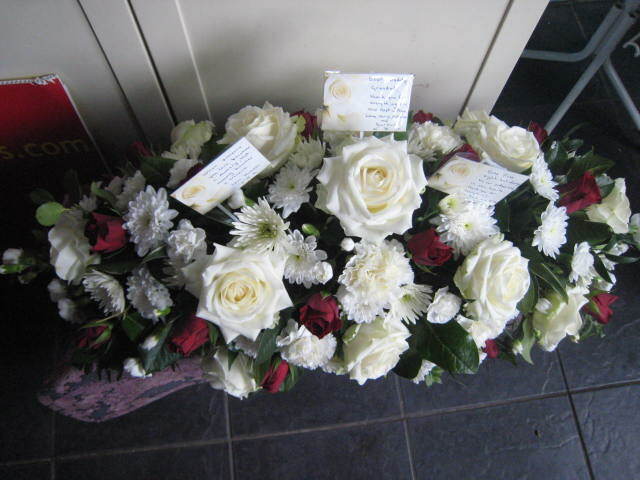 If you order directly from the Funeral Director then the price he quotes for the floral tributes will include a significant cut just for arranging them. 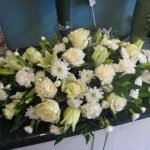 The flowers will be made by a florist but the funeral director will be adding on at least 30% maybe more as his commission. 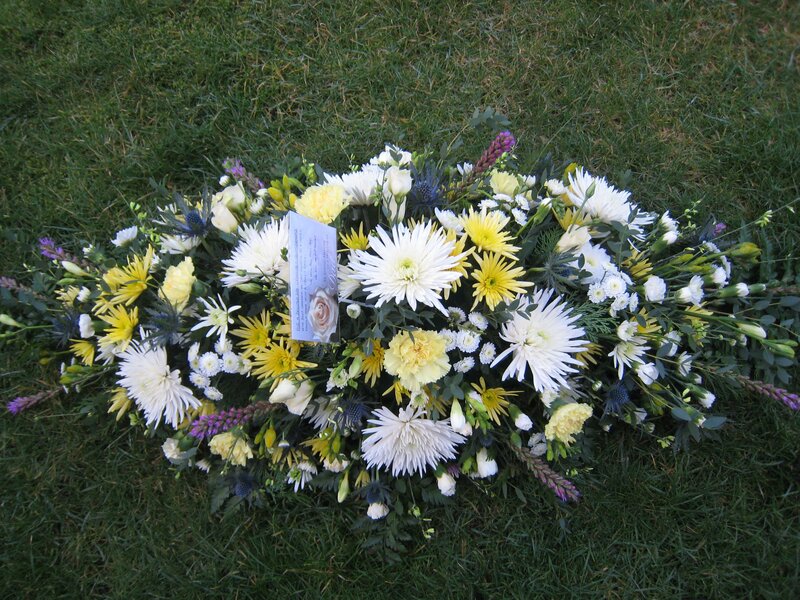 You can avoid this by dealing direct with us – we have no cosy associations with any local Funeral Director. 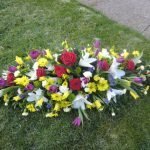 We made this decision when we first started our business over 17 years ago, so that we can offer you a personal service at this sensitive time. 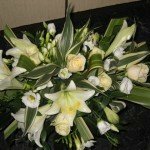 We are here to help and advise you on your individual needs. 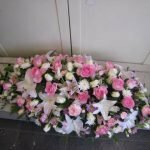 All our flowers are ordered specially for the funeral and we do not use flowers that have to come to the end of their shelf life. 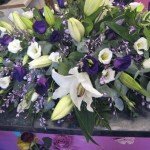 Call us now 01942 606666 to discuss your flowers. 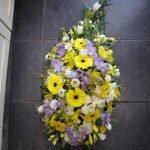 AS FROM TUESDAY 3 APRIL 2018 WE WILL BE OFFERING A HOME VISIT TO DISCUSS YOUR FLOWERS PLEASE TELEPHONE US TO MAKE AN APPOINTMENT. 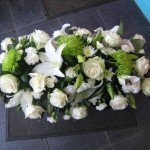 FOR THOSE WHO ARE NOT AWARE OUR SHOP PREMISES HAVE NOW BEEN SOLD BUT OUR FLORIST BUSINESS CONTINUES AS NORMAL AS A HOMEBASED FLORIST. 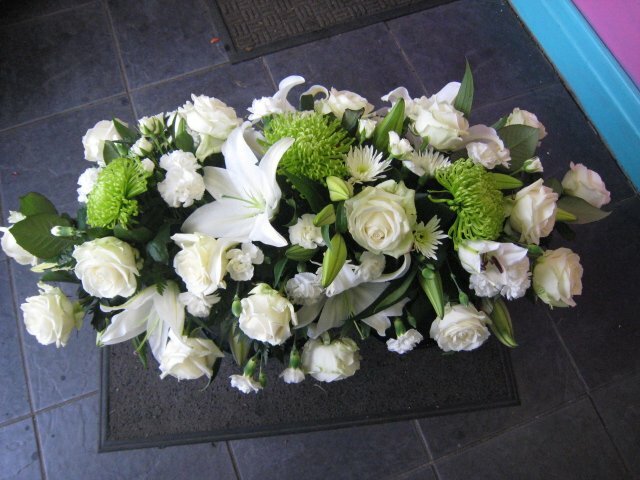 Please note we can only deliver to Leigh and surrounding areas near our shop – not throughout the UK and worldwide. 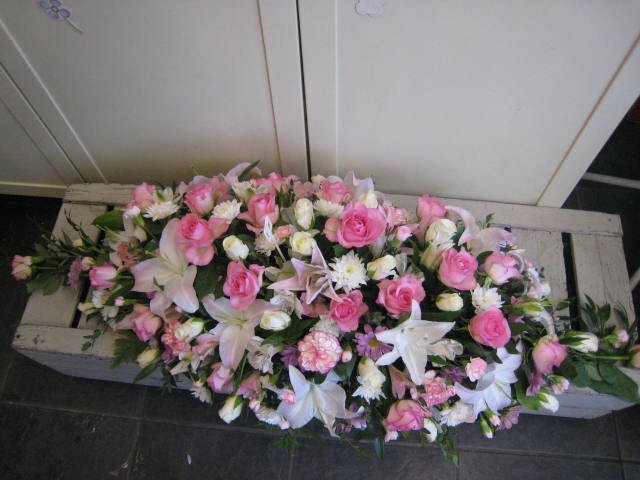 We can design your casket spray to your individual requirements ie. 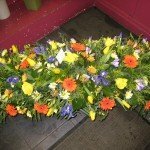 flower choice and colours. 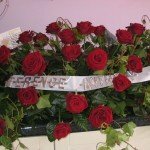 Ribbon banners can be added if you wish. 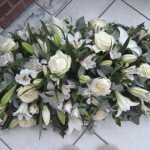 They can be made in a single flower choice or mixed flowers and made from 3ft in length upwards. 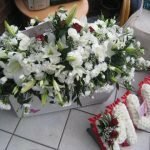 The final cost of the casket spray is dependant on the flowers used in the design and may be subject to change at peak periods. 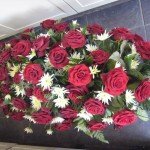 Price Guide From £75.00 for 2ft to £200 upwards (5ft) includes FREE DELIVERY. 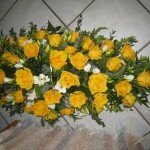 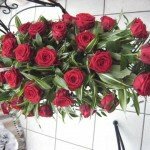 Total cost depending on type of flowers used in each arrangement. 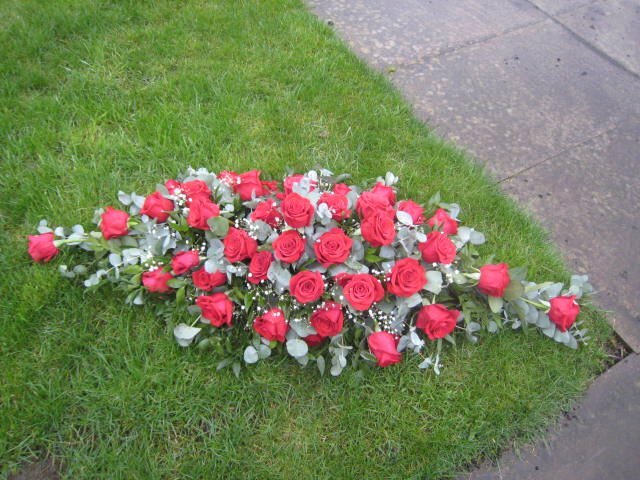 A 5ft coffin spray filled with Red Freedom Roses and a touch of gypsy with soft ruscus and eucalyptus foliage. 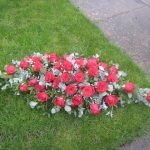 Grand Prix Red Roses and trailing ivy with foliage in the first design. 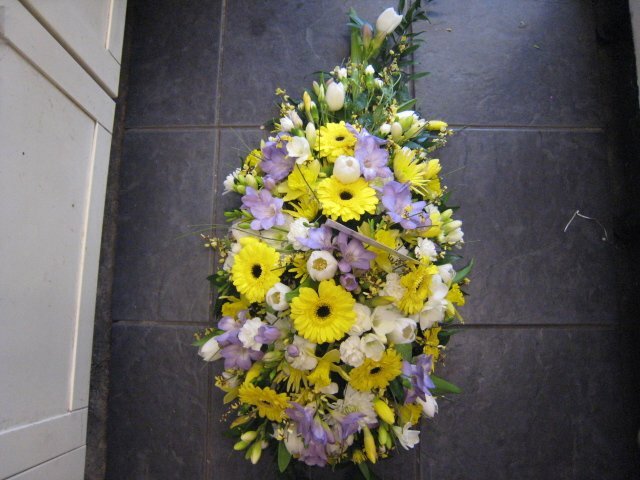 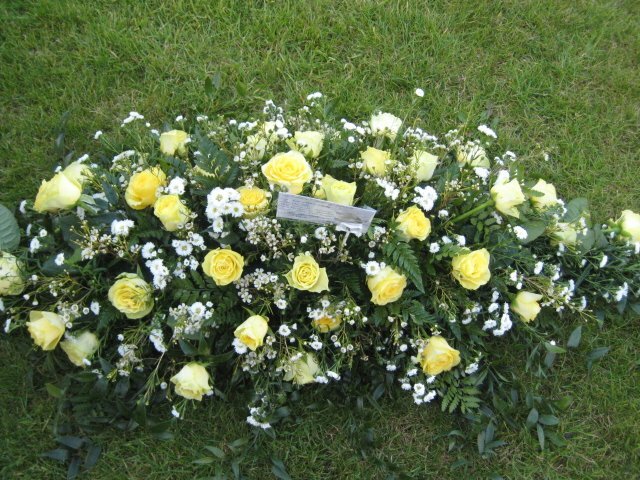 The second design slightly different with lemon tip foliage arranged in a 5ft coffin spray. 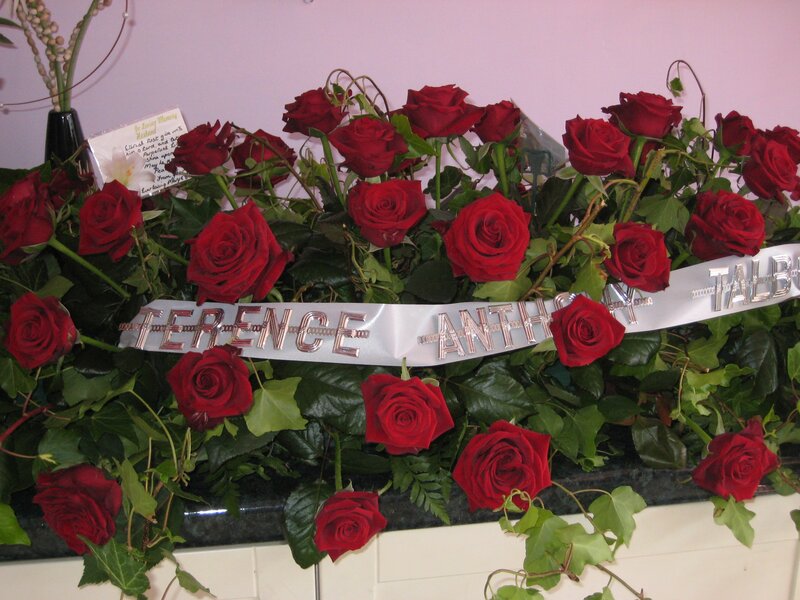 A ribbon banner can be added with any wording. 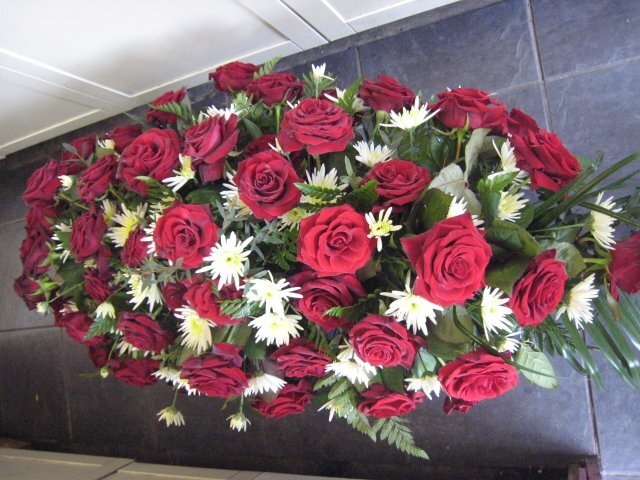 Stunning Grand Prix or Red Naomi red roses and cream spider chrysanthemum and foliage. 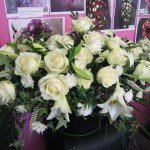 There are many types of flowers and people often find choosing a flower that was a favourite makes the spray more personal. 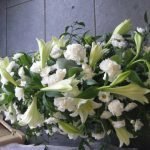 These designs are just a guide as to what is available. 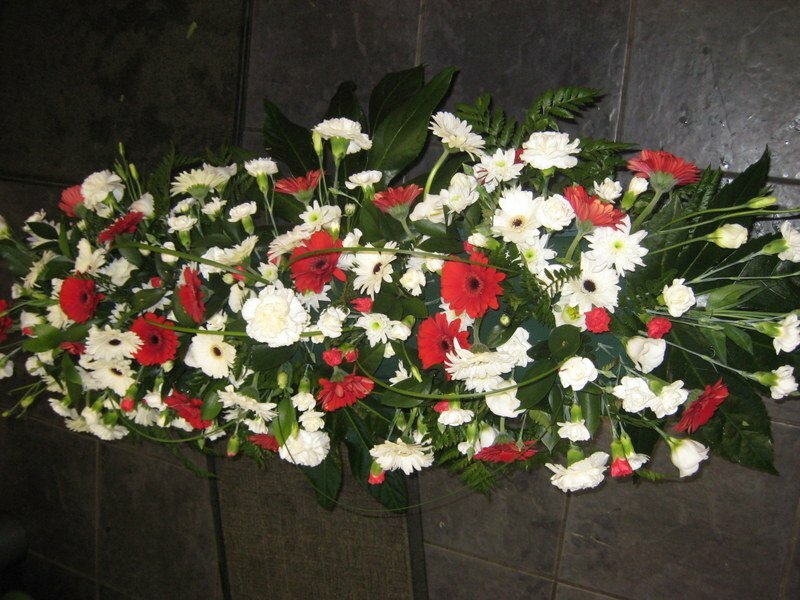 We can help you choose the most fitting tribute just give us a call or email and we will do our best to help. 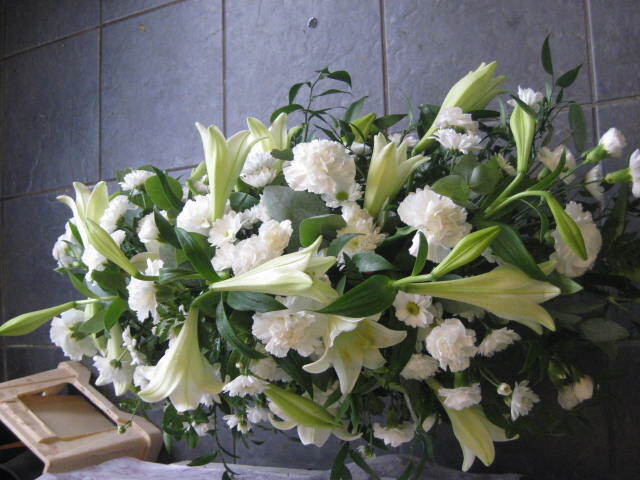 White anthuriums, lilies, lissianthus are just a few of the many white flowers used in this spray. 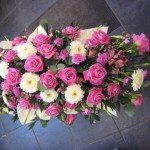 WE ARE ON FACEBOOK AND INSTAGRAM SO YOU CAN SEND US A MESSAGE. 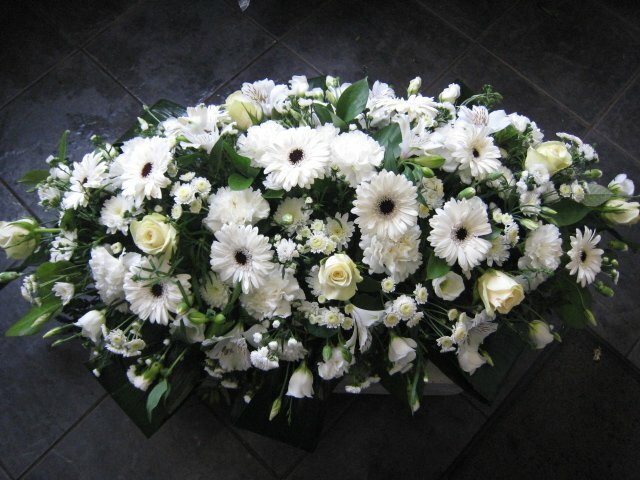 White gerbera, roses, carnations and other seasonal flowers make up this beautiful spray. 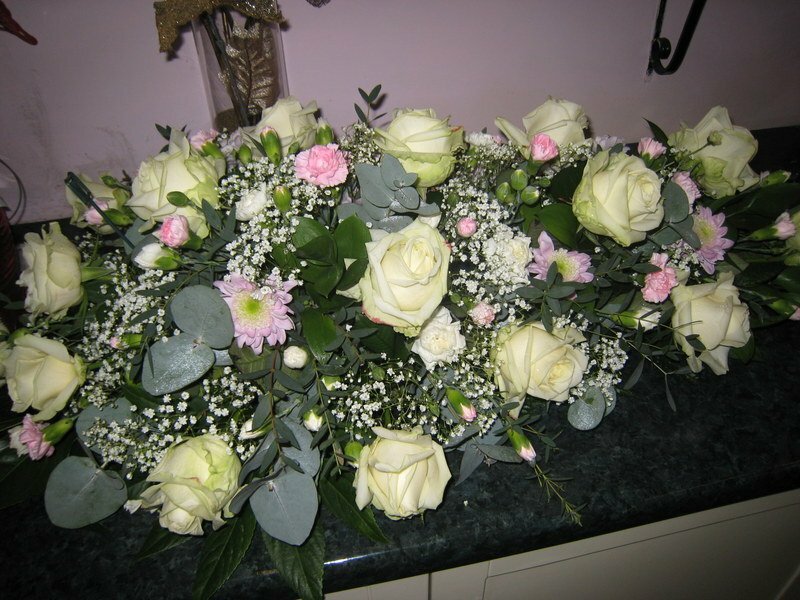 Beautiful avalanche roses with a touch of pale pink flowers and foliage. 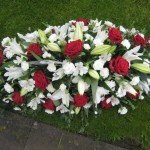 Suitable for a baby or young child. 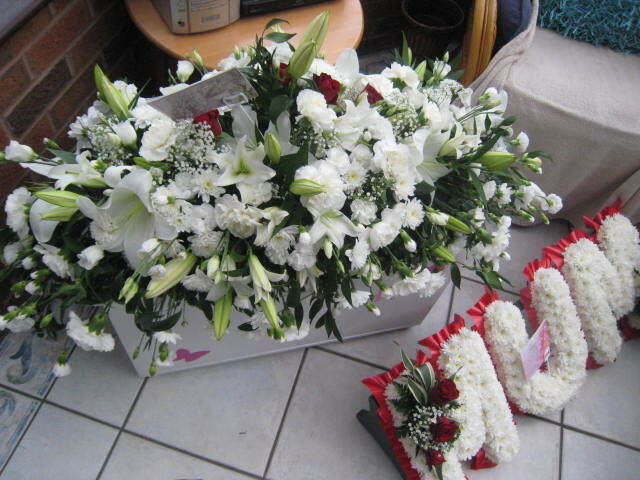 White stargazer lilies, white spray and single carnations, chrysanthemums and lissianthus and foliage. 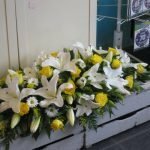 A 5ft coffin spray filled with yellow roses, purple lissianthus, white stargazer lilies and spider chrysanthemum and foliage. 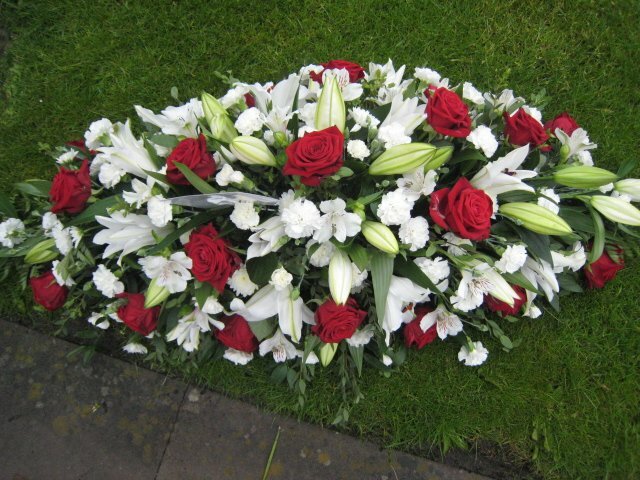 This coffin spray was made with mainly white lilies and white lissianthus with red roses going through the spray. 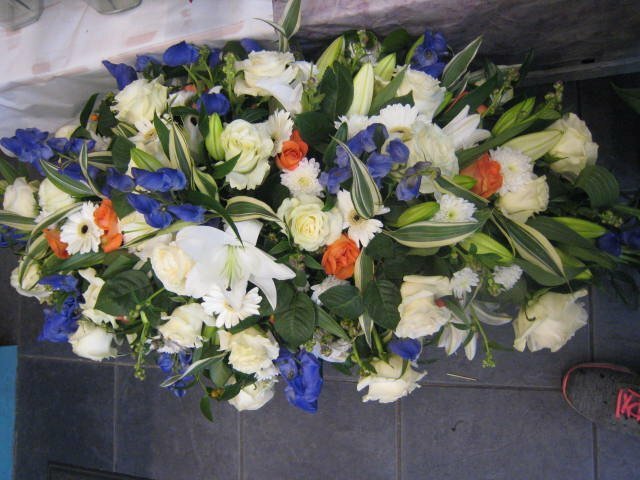 A 5ft coffin spray filled with crisp cream avalanche roses, tiny orange roses, carnations, chrysanthemum, lemon tip foliage and blue aconitum flowers. 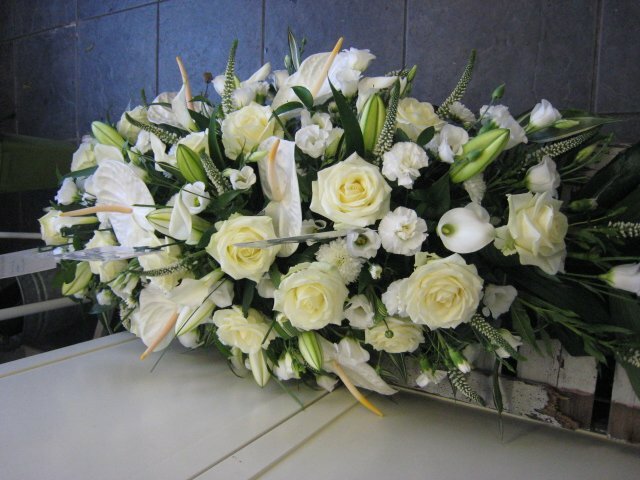 A 5ft coffin spray filled with beautiful Aqua Roses, White Gerbera, Anthuriums, lissianthus, and foliage. 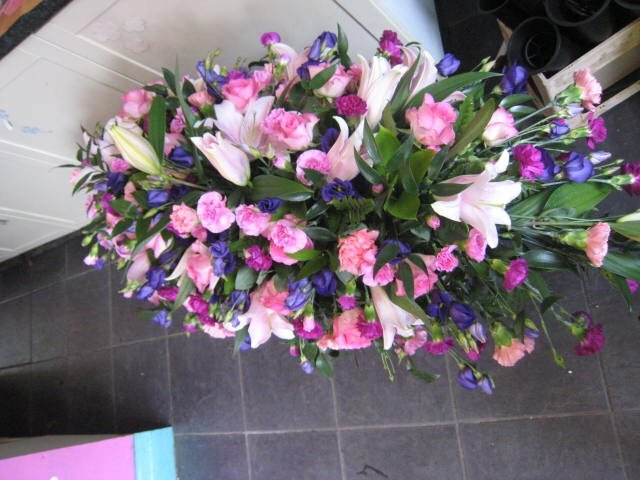 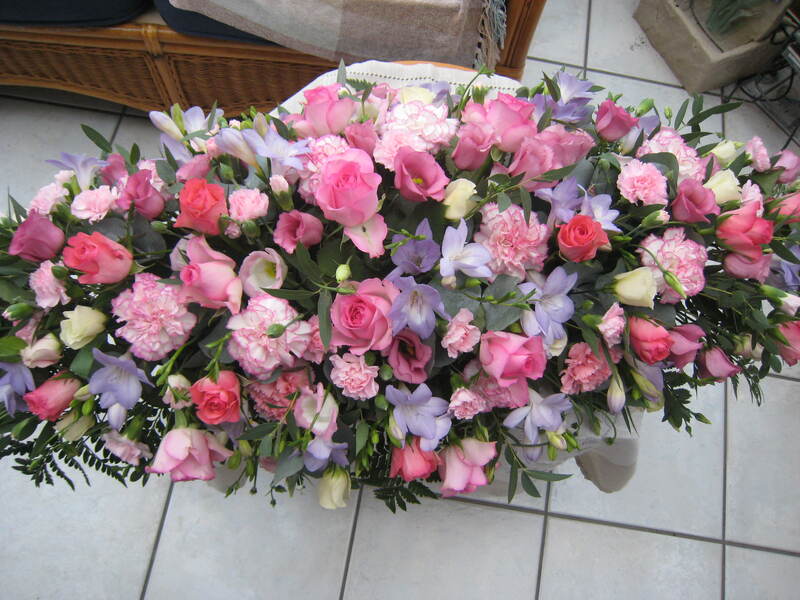 A selection of pink roses, lilac freesia and white and pink lissianthus and foliage. 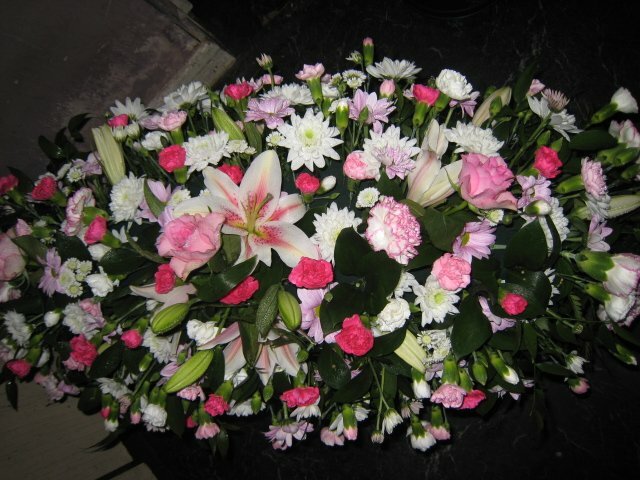 A selection of pink stargazer lilies, white and lilac seasonal flowers make up this coffin spray. 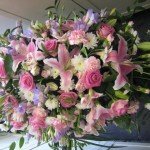 Stunning pink stargazer lilies, purple lissianthus, pink roses and spray carnations and foliage. 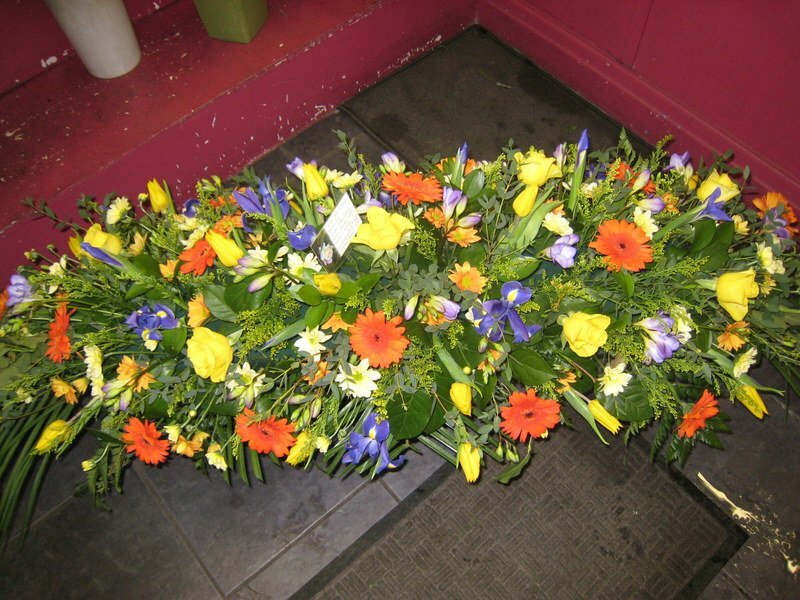 A coffin spray filled with purple, yellow tulips, white lilies, yellow chrysanthemum, yellow solidaster and a few red roses added to comemorate a Liverpool Fan. 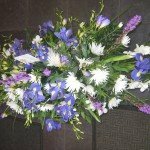 Please note spring flowers only available from January to April. 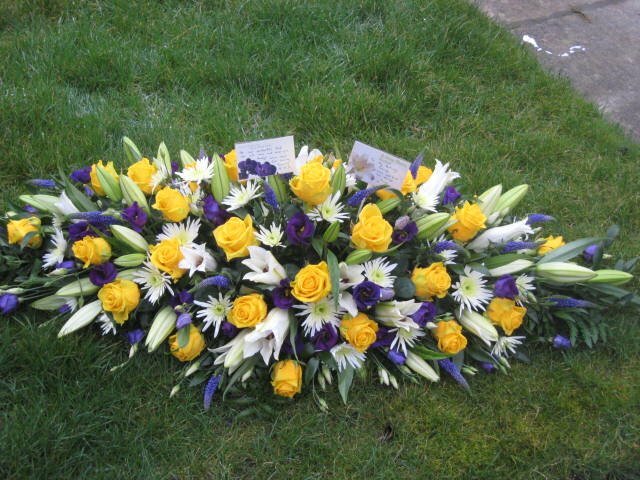 Seasonal delphiniums, yellow roses and white gerbera with white spider chrysanthemum make up this vibrant coffin spray. 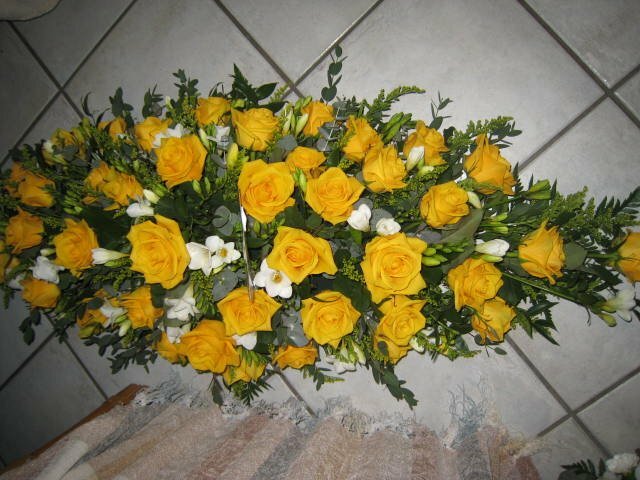 Best Quality Yellow roses and seasonal white flowers and foliage. 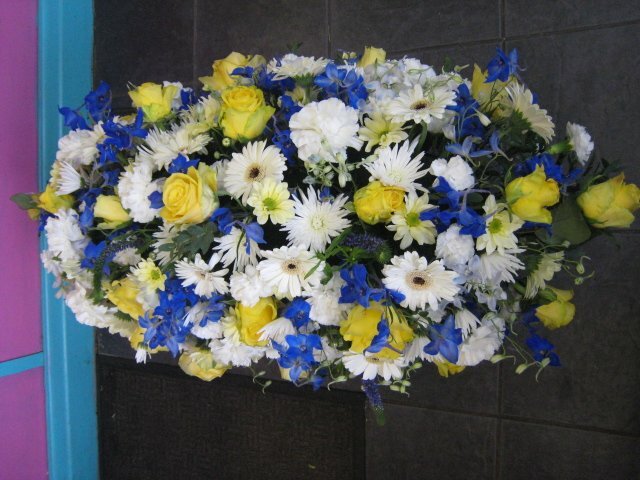 Yellow Spider Chrysanthemum, Blue Delphiniums, Yellow Roses and White Carnations with lemon tip foliage. 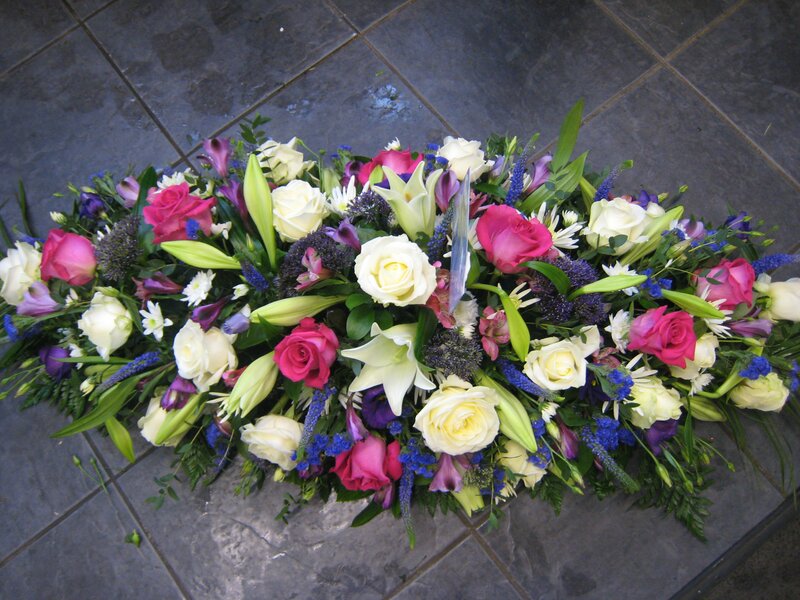 Roses, Lilies, Purple Veronica and other seasonal flowers make up this coffin spray. 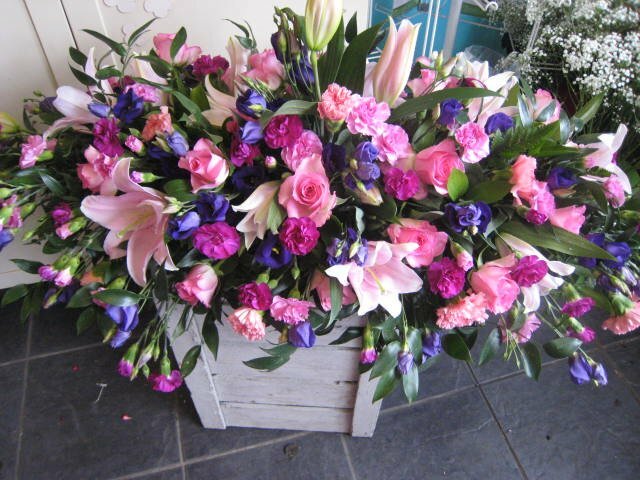 Seasonal summer flowers make up this fresh and vibrant spray. 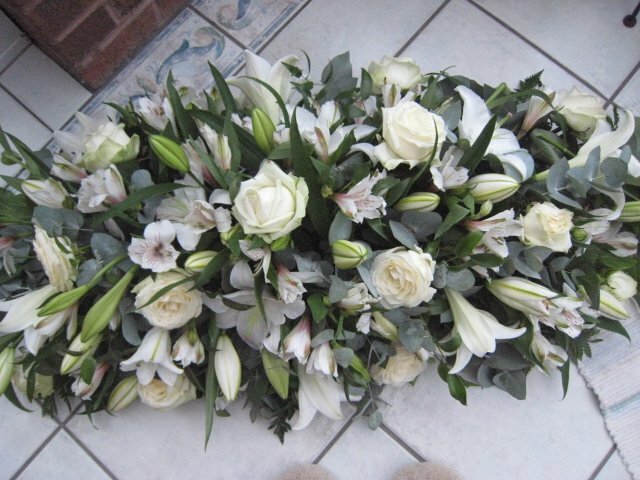 Crisp white stargazer scented lilies, pale pink roses and white spray carnations and foliage. 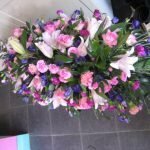 Beautiful pink scented stargazer lilies, roses, carnations, chrysanthemum are just some of the flowers filled to the brim in this spray. 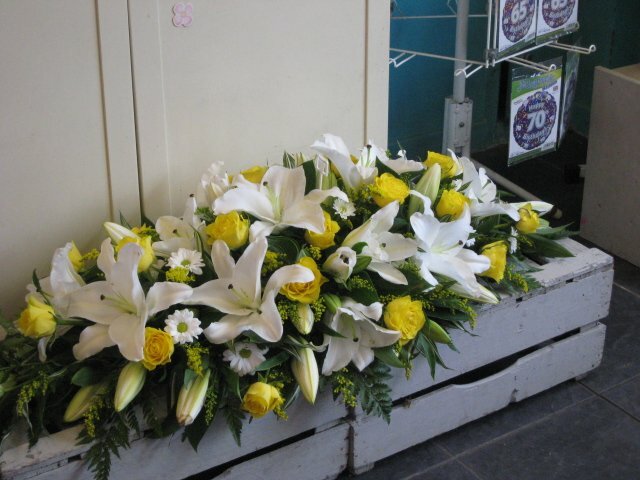 Crisp white stargazer lilies, yellow roses and white chrysanthemum and foliage. 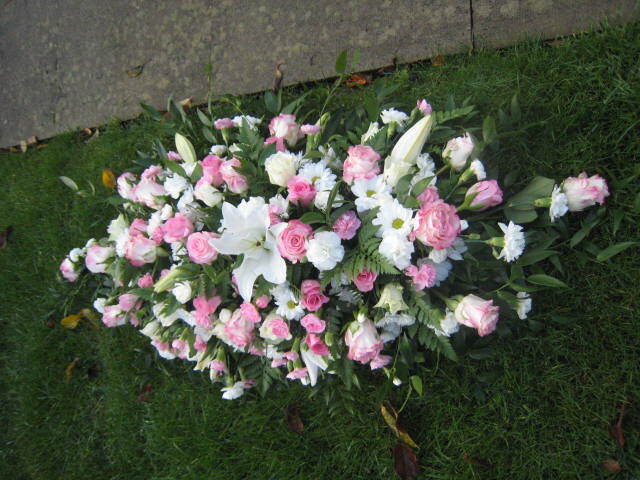 A coffin spray approx 4ft made with pink roses, a few white lilies and white chrysanthemums, spray carnations and white roses and foliage. 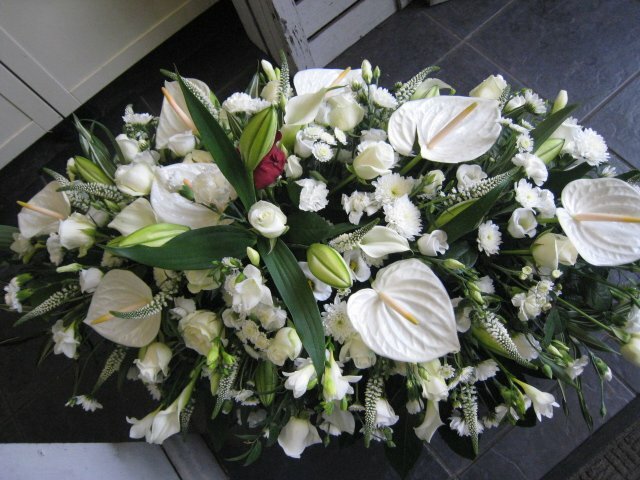 A smaller coffin spray made with longiflorium lilies, white spray carnations, white chrysanthemums and foliage. 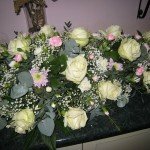 We can make your coffin spray to any size these are approx. 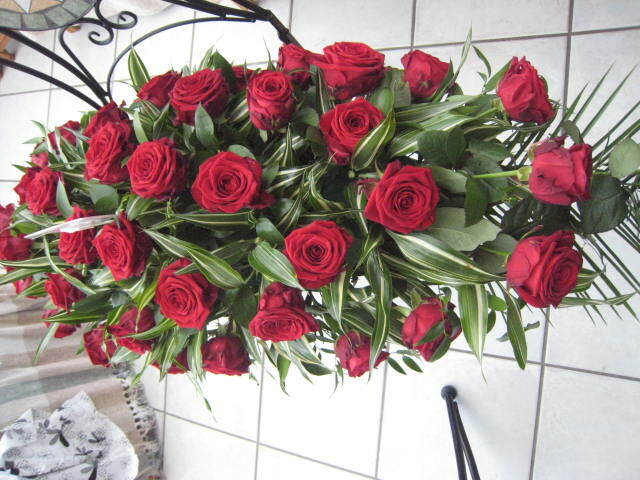 2 – 3ft . 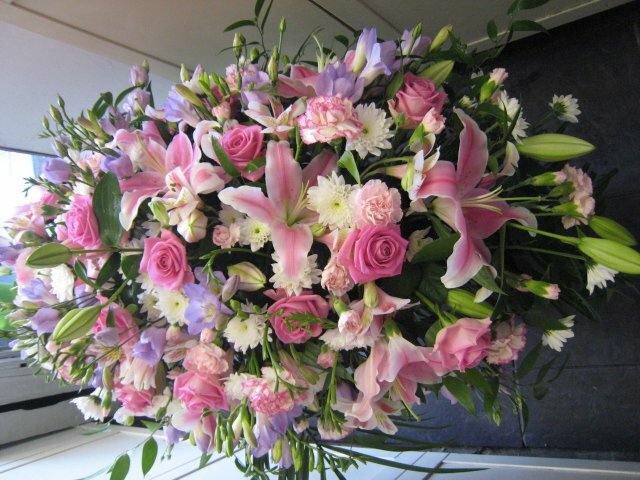 The actual price depends on the flowers used in the spray. 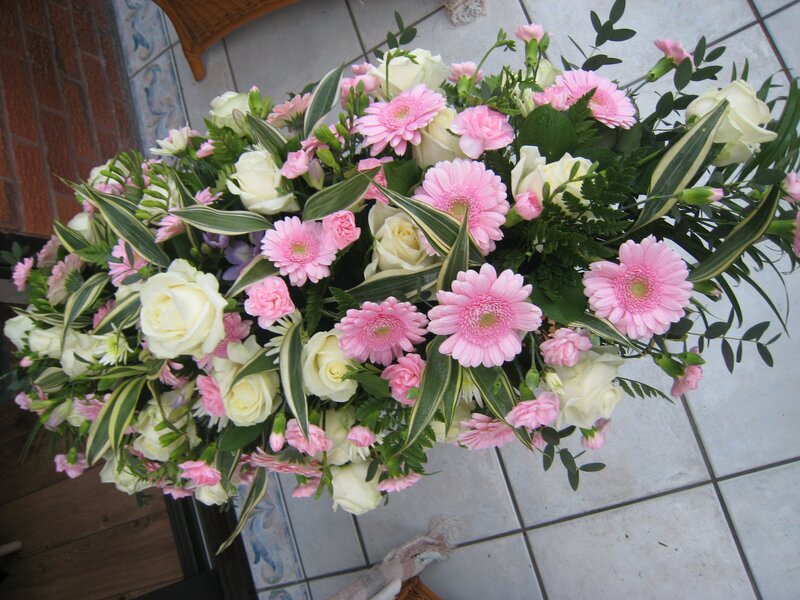 Any combination of flowers and foliage can be arranged. 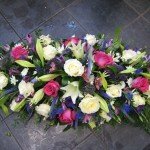 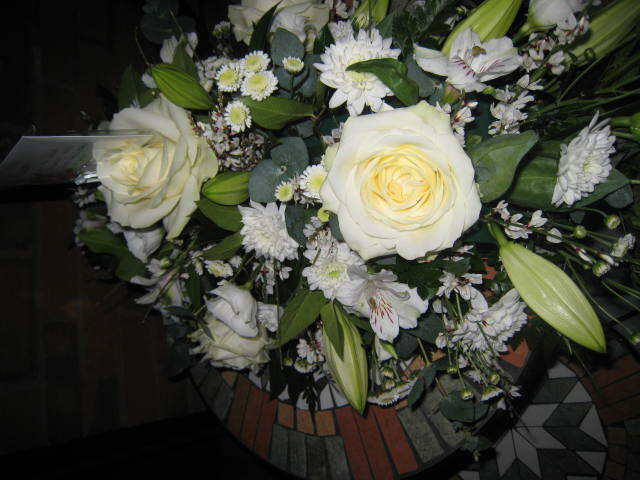 All our arrangements can be made in your own choice of flowers and colours. 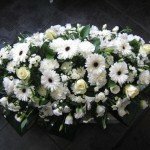 Please try to give us as much notice as possible for funeral arrangements. 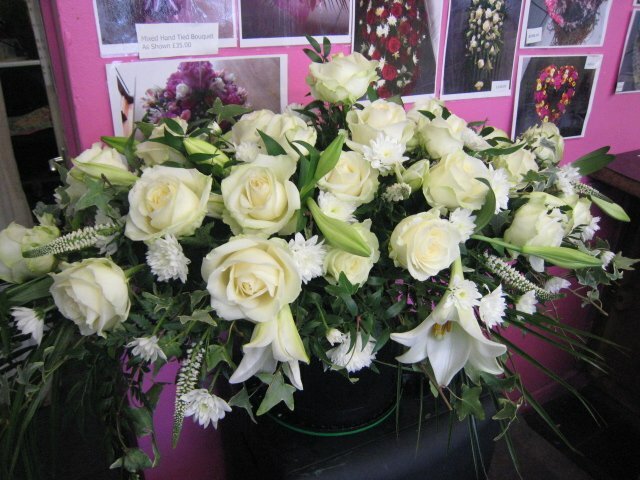 All flowers used will be ordered specially for the design. 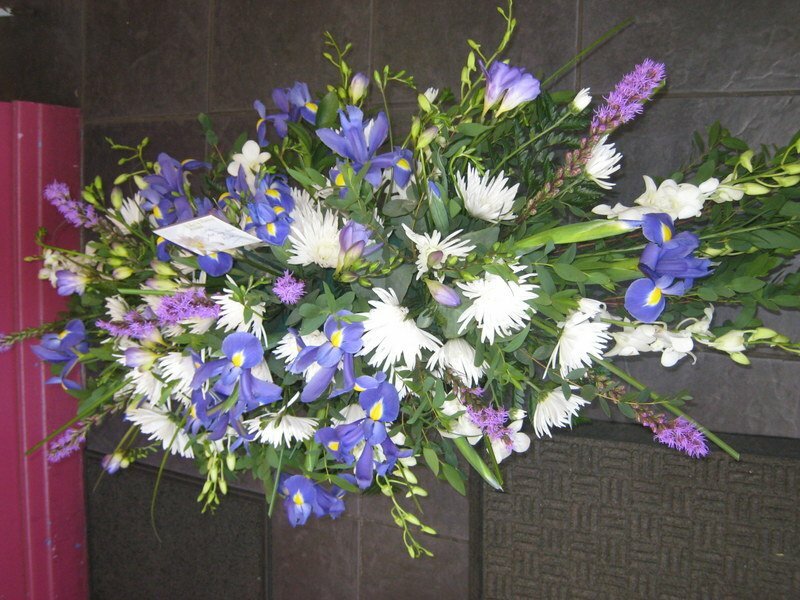 or send us an email if you have missed us for the day – all our emails are answered in the evening if we are closed. 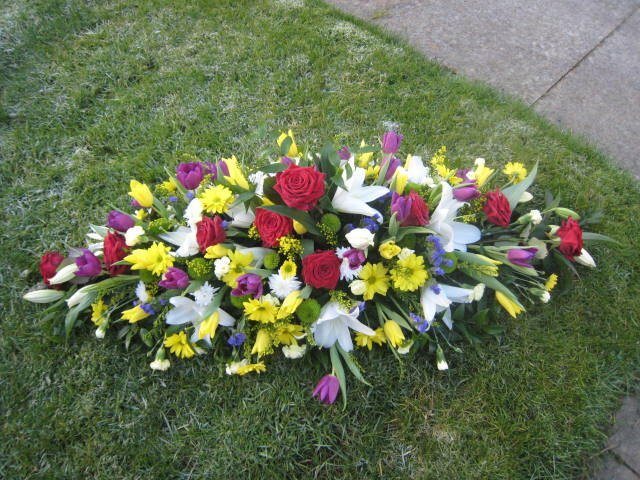 If you would like a smaller casket spray to just cover the centre of the coffin rather than a full length one these can be made from £70.00 upwards depending on the content of flowers used. 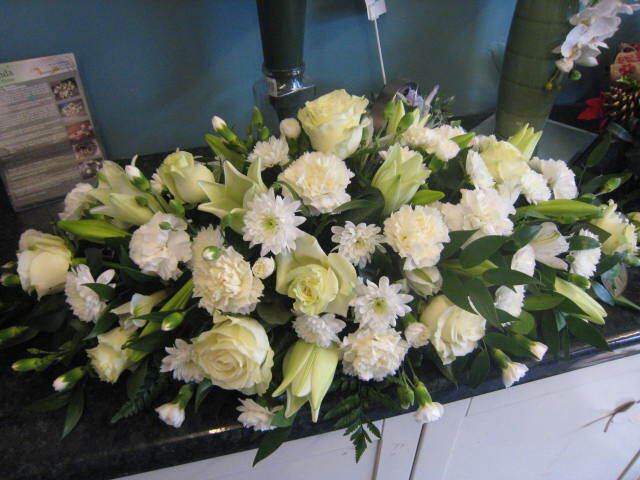 This one was designed using white flowers with a touch of green shamrock. 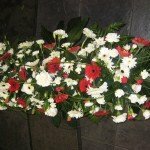 They can be made in various flowers and colours to your individual requirements. 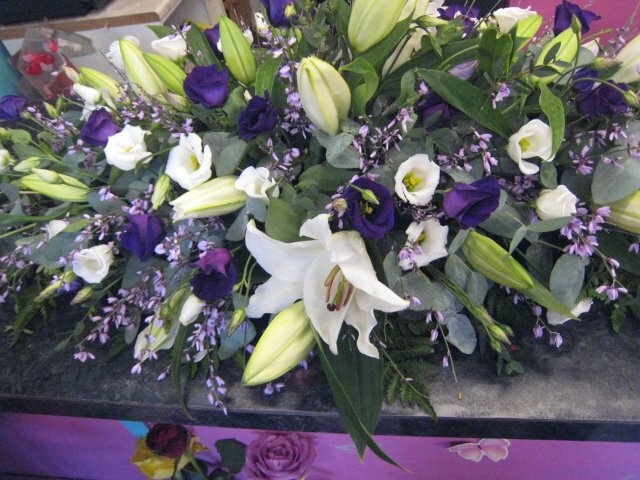 These pictures portray just a few of our designs…. 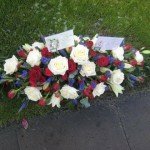 telephone us or email us for more help and advice on choosing your tribute. 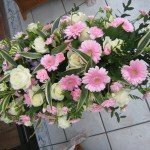 We endeavour to answer all our emails even when our business is closed for the day. 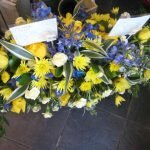 We have been trading in Leigh for over 17 years offering our customers the best quality flowers available from all over the world. 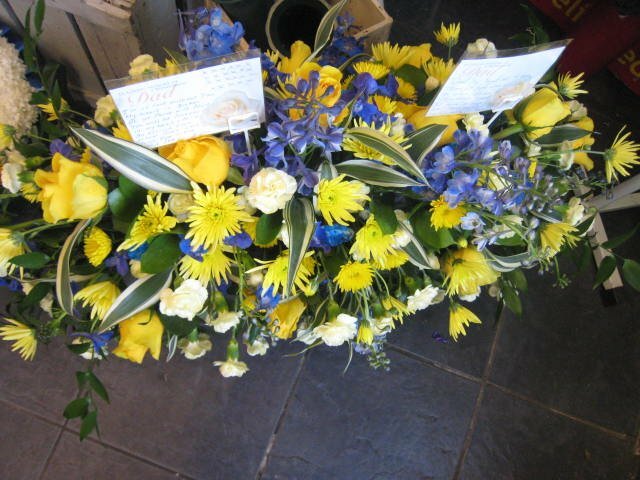 IF YOU ARE UNABLE TO CALL INTO OUR SHOP WE WILL BE HAPPY TO COME TO YOU AT A CONVENIENT TIME.